Beaumont Claims to have Refunded $624,000 in Taxes in July. That never happened. At least former Finance Director Bill Aylward actually knew how to set up and operate a finance department. Aylward didn’t know how to forge books, which is why they got busted, but he knew how to properly maintain accounts. Beaumont’s Finance Department is so deteriorated that the general ledger isn’t even properly formatted. 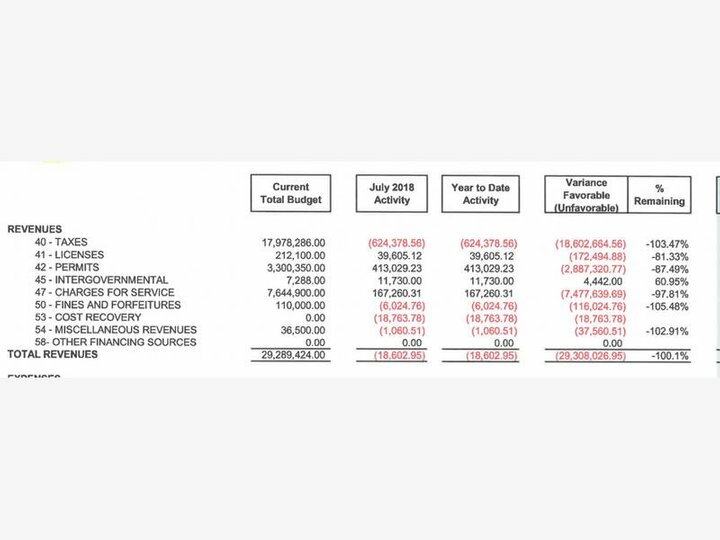 The July Income/Expense Statement claims that the City paid out $624,378.56 in basic Taxes, $6,024.76 in Fines & Forfeitures, $18,763.78 in Cost Recovery, and $1,060.51 in Other Revenue. Did everyone receive their tax refund from the City in July? The first line of the July Income Statement states that the Year’s budget revenue for ‘Taxes’ is $17,978,286.00. In July $624,378.56 was paid out, which leaves the City with a remaining Taxes Budget of $18,602,664.56. The City even lists ‘% Remaining’ in the projected Taxes revenue at 103.47%. The projected revenue for ‘Cost Recovery’ was zero, implying that the City was removing the account from the budget, which would remove the account from the General Ledge, so there should be no journal entries under Cost Recovery. And, as usual, what’s missing is the Mitigation Fees. What the City of Beaumont never reports is the Developer Mitigation Fees collected to build Fire Stations, a Recycled Water Facility, Roadways, or a Regional Park and yes, the City is still collecting Mitigation Fees for a Regional Park that they refuse to turn over to the BCV Parks & Rec District. But the Mitigation Fees are never accounted for. Instead of depositing the money in separate interest-bearing bank accounts the mitigation fees are deposited into the General Fund where they’re misused/embezzled instead of building the City’s Infrastructure. The Audit and Finance Committee is a Federal S.E.C. requirement because the City of Beaumont has acquired hundreds of millions in Federal Bond Debt. The theory is that this Committee would do their job and prevent the forging of financial statements, but the requirement did not account for human nature. After the Raids everyone had hope that the City would hire honest, qualified Staff – especially in the Finance Department. Instead Beaumont City Council gifted the title of finance director to Melana Taylor, who has no experience as a finance director or in government accounting. The blatant forging of the 2017 Audit and stage shows involving Don McDougall posed as a ‘GASB Teacher’ by Melana Taylor, Mayor Nancy Carroll, The Pun Group, and Beaumont’s Financial Advisor/Kapanicas Associate Urban Futures should have produced the Resignation of Nancy Carroll and the firings of Urban Future, The Pun Group, and Melana Taylor. At the October Meeting I requested the General Ledger since the 2018 Books were completed and the Financial Statements had been sent to the Auditors. To this day I have not received the General Ledger for Fiscal Year Ending June 30, 2018. I was told by the Committee Chair, Steve Cooley, who also has an Accounting Degree, so he knows right from wrong, blabbered on with excuses as to why the City can not produce their general ledger.